What is the simplest way to move data between Azure Databases? Let's see. Whenever I have a requirement, the first thing that I ask myself is what is the simplest way I can solve a problem. 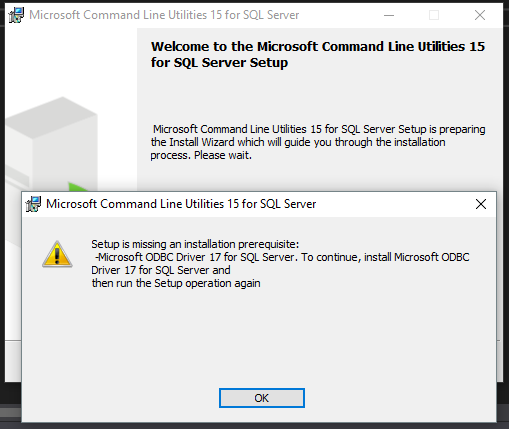 This time, I was asked to migrate an Azure Sql Table to Production. Let's see how we can do it. One simple option definitely would be using bcp, so why not? I downloaded it and during the installation, was surprised with the message below. Since I don't like installing things for an one-off usage, I decided to search an even simpler solution. PolyBase does not require you to install additional software. You query external data by using the same T-SQL syntax used to query a database table. The support actions implemented by PolyBase all happen transparently. So let's migrate this data in simple steps. An external data source is a virtual representation of your remote database. With it, you'll be able to access your remote database locally. The first thing we'll need to do is to create a SCOPED CREDENTIAL to store the remote data sort address/credentials on your local Sql Database. Once created, we can already select from that table and see results from the remote host in our current connection. Step 3 above was to illustrate how to move data between servers. In fact, after you created your external table, you can join, query, and do almost everything else as if the remote database were present on the source server. On this post we reviewed how can we easily migrate data between databases using Sql Server's PolyBase feature. There's a lot more on this topic and I encourage you to research and learn more about it. The full source code for this post is available here.